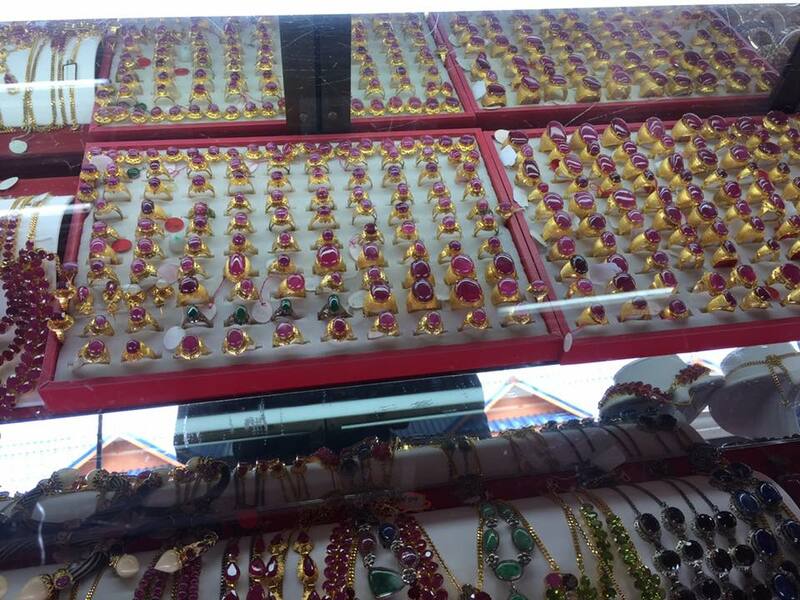 I was in northern Thailand and we dropped by an outdoor shopping area with lots of jewelry. Everyone in our group went shopping. Silver, gold, and gemstones were everywhere. I spotted a nice blue sapphire that was over 5 carats and looked through a loupe to check its inclusions. I found curved striae and that proved to me that it was a manmade sapphire or vermeil. This meant that the 500 dollar asking price was way too high and I did not make a counter offer. Other people in our group made great purchases. Hand made jewelry was very underpriced and was a good deal depending on what you bought. Pictures: Over 200 pieces of jewelry in this case!! Most of it is cabochon rubies set into 24K gold plated silver.